Most folks on Provincetown's breakwater this afternoon are fishing as kayakers revel in Indian summer weather. OK, true "Indian summer" weather usually means the return of summer weather after a killing frost, and we haven't had one of those yet, but I'm going to count it, especially after the overnight low temperature was a chilling 39 degrees two nights in a row last week. I don't know a better way to describe these absolutely gorgeous days we've been having. Get out and enjoy this beautiful weather today, because this may be the last of it, with a pretty good chance of rain tomorrow and daily highs dipping down into the 60s next week. 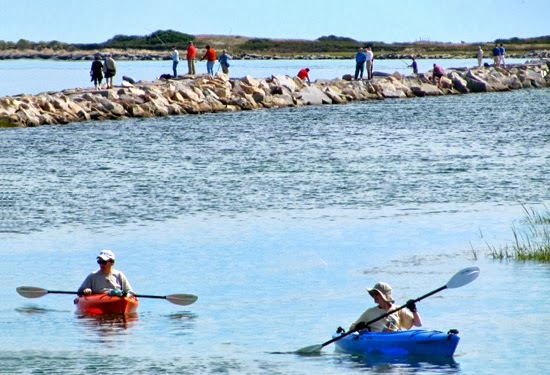 That'll make it more like fishing weather than kayaking weather, but still lovely for hiking, biking and many of the outdoor activities that make Provincetown such a remarkable spot.